I ordered several books on timberframing (I suggest both of Sobon's books, and all three of Benson's books, more on this later). 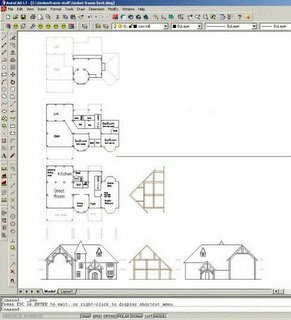 These gave me an idea of how to layout a floor plan for a timberframe house and showed which of my fallen trees might be suitable for a timberframe. 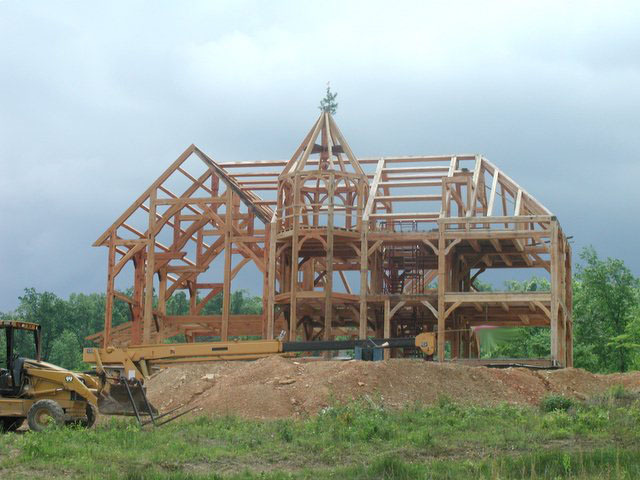 I called several timberframing companies listed in the current timberframe magazines and asked if they could/would use our timbers to build a timberframe for us. To my surprise I quickly found out that some of the timberframe companies will only use pine (or oak or spruce depending on the company) for their frames and most of them outright declined to use timbers from anywhere but their established suppliers. They most often cited quality control issues. I can see their point, but it seemed to me that a specification for the timbers could be given (squareness, size tolerances, slope and twist of grain, straightness, etc.) and those timbers not meeting the specification could be rejected. Furthermore, if there were willing to use salvaged timbers from old barns and buildings, how much worse could my timbers be?! Oh well, if they didn't want the business, why bother... I checked them off the list, and boy the list shrank quickly! Some begrungingly agreed that they could use our timbers. For instance, I was really interested in Sunset Structures because they were close by, and had a technology for drying the green timbers to achieve a better frame. Although I never inquired about any kind of guarantee, they felt obligated to tell me that they would not guarantee the frame if I supplied the timber. When I mentioned that I had many logs to choose from, and that several were likely to be veneer-quality logs, they said that their logs came from a different region of the country (not more than 200 miles from here), and so my logs were likely to be inferior in any case. But as I said before, if it seemed like the timberframe company didn't want the business, I did not pursue them. Of the companies I found that were willing and happy to use owner-supplied timbers, all required the timbers to be shipped to them (actually to a 4 sided planer and then to them). This requirement was not at first clear to me from reading the classic books on timberframing. In fact, I had a naive assumption that a group of timberframers might desend on my property and complete the joinery here. This assumption had been reinforced when my wife and I visited a couple in our area who explained to us that a group of Amish carpenters had actually came and notched their frame frame on site. 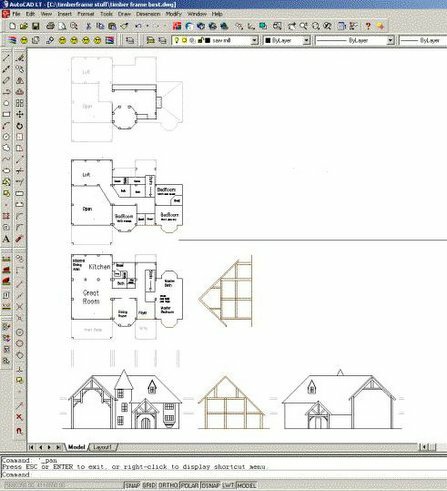 As it turns out, it takes hundreds of man-hours to complete the joinery for most timberframe homes (unless of course the company owns a $400,000 CNC machine! ), and most of this work is best done indoors where people, tools, and timbers can be kept out of the weather. Whether the framers came to our timbers, or our timbers were sent to the framers, it was clear that proximity of the timberframe company to our location was a definite requirement if any cost benefit was going to be had by using our timbers. The requirements that (1) the timberframe company be amenable to using our timbers, and (2) within a 400 mile radius, narrowed our choices substantially. In the end, I found two companies that seemed like excellent candidates (of course there were probably others). They were Timbersmith and Oakbridge Timberframers. Besides the Amish-built timberframe mentioned above, the only other timberframe house in our area that we were aware of was built by Timbersmith and the owner was very pleased with their work. (that owner had supplied the timbers too... it could be done!). I provided Timbersmith with elevation drawings and floor plans (sketches really... created in AutoCAD LT) for a 3900 square foot home and they gave us a quote of $100,000 (even) to complete the joinery and erect the frame, assuming that we would supply the timbers (they wanted only oak) and we would pay for the crane. Although $100,000 sounded like (and still sounds like!) a boat load of money, it was probably a fair price for the frame to be provided, but I couldn't see that we were really getting any substantial cost benefit by providing our own timbers. Oakbridge quoted (based on square footage only - no floor plans or elevation drawings) a rough price of $75,000, but Oakbridge would require at least one year before they could start on the project. The main contact at Oakbridge was probably the nicest, most helpful, straight shooting person that I spoke with in the industry at that point - no wonder their backlog was so long! So after starting with a list of two dozen, I had found two timberframe companies that seemed (gladly) willing and (very) able to frame a house using our timbers. But the cost seemed (at the time) high, and the potential starting date so far away. I took my findings back to our craftsman friend who had introduced "timberframe" into our vocabulary. "You know, this isn't rocket science," he said, "you could do this (yourself)... I once took a class on timberframing..."